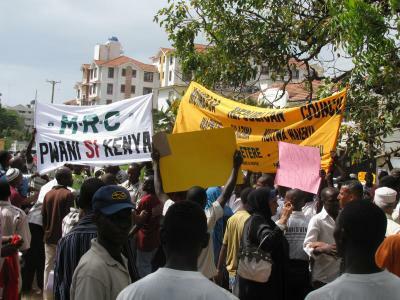 MRC Leaders predicted a division of Kenya into countries soon at a Press statement in Mombasa. - SG Randu Nzai - Bana Kenya News, Real African Network Tubanane. Mombasa Republican Council (MRC) has issued a media briefing in Mombasa saying that the Election will proceed in Kenya but not in Coast region. The MRC has given a warning to the Jubilee government that as they force things, people will get tired soon. "Let the government force people on whatever they think. They need to keep in Mind that they have their own people here who live within our residential. If the Government does not respect its people then we will need to force other things on them. The best way to go within the next 20 years will be dividing the country into pieces, and that is what will happen. " said Albert Gogo an MRC official.
" We have evidence that Coast region has been used by the Modern colonizers to enrich themselves and as the British protectorate, we are just marking time. We have seen our people suffering, they do not have jobs, no good hospitals and staying in a bad economic environment. The Government has been advocating for Chinkororo and Mungiki and Now as MRC members we need to wake up." MRC executive Secretary Randu Nzai said. "Let them continue with what they push. We are happy for our own MP Owen Baya who is pushing for the same. For us to build good schools, hospitals, reclaim our lands and jobs, we need to have our own government." he stated. "Just think that our leaders are unable! No, their capability has been deliberately compromised. e.g Mombasa Governor with the Japan embassy did a layout of building a bridge at Likoni, do you know what happened? So do you think Hassan Joho is unable? It is deliberate move to frustrate everything at the Coast." "The Presidential polls will be forced to our people but until the people realize that even a saint cannot flourish in the Government that is when we will resist," he added. The MRC was gazetted as an outlawed group by the former interior Minister Prof George Saitoti. The group was listed with Mungiki, Chinkororo, Bangladesh, Kamjesh, 40 brothers and many more groups.